Guess where they plan to put it. See reader comments on my trip below. 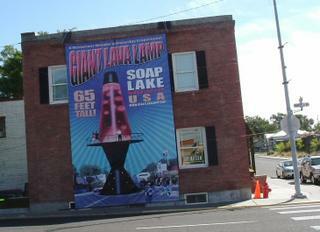 This is one of many tidbits I learned on my 2005 bicycle tour around in the Pacific Northwest. PS. 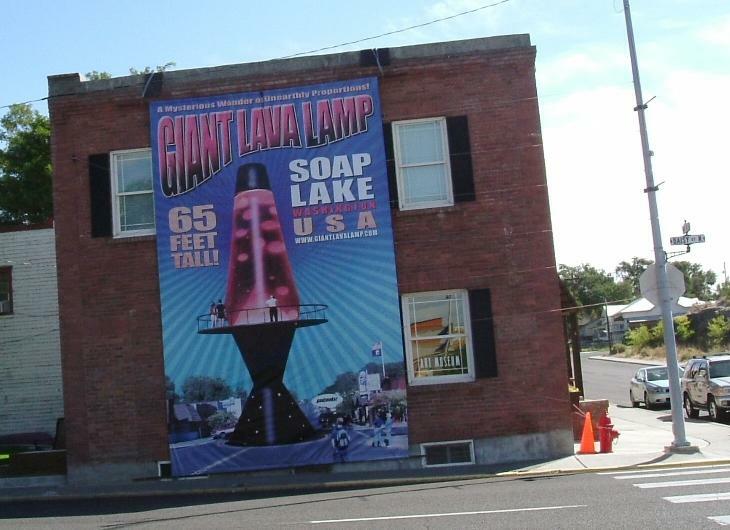 Incase you don't believe me, about just the lamp, you can also visit Giantlavalamp.com. Cool pics, Robert. One of the first benefits I noticed when I gave up the car centered lifestyle was that I was seeing things that I would have never seen at 30-70 MPH. Distance is a function of space plus time, and when you travel by foot or bike, the world seems so much bigger. Details that are just a blur from a car window are filled in. You feel the sun's warmth and the cool mist of fog, the caress of the wind. The sounds and smells of a place envelope you. You stop and chat with people on the way, gaze in the storefronts you pass by, listen to a babbling brook or the sound of rustling dry grass as a gust of wind sweeps across a field of wheat like waves on the ocean. I am always having minor epiphanies, like yesterdeay when I was walking through downtown Everett and passed by a cafe I'd never noticed while driving by. It had been there 3 months, and I know I've driven that street at least three times since then, but with an 18' frontage and no electric signs, I never saw it. But Thursday, I smelled it first, the noticed the bikes parked out front, so I entered a small non-descript door into the nicest coffe shop in town. It was a 100 year old building, wood floors, exposed brick interior walls, exposed duct work on the cieling. The furniture was an eclectic mix of couches, coffe tables and overstuffed arm chairs, salvation army chic. They were playing great music from our local independent community radio station KSER FM (90.7 FM, streaming on the web at kser.org). The menu was cafe fare, light breakfast, soup, sandwiches and vegan cookies. I had a pannini bread sandwhich with chicken, sun dried tomatoes and provalone cheese. Best sandwhich ever. Seriously, it was totally grubbin', as my son would say. The world is just so much bigger when you slow down enough to see it. What wonderful photos! Looks like another splendid trip. I envy you your stamina, I get tuckered out just putting around town, I couldn't imagine logging that many miles in a row. Thanks for letting this old fat guy live vicariously through your vacation pics. I am at Dartmouth College this evening as it has poured rain all day. The weather forecast is to expect flooding and high winds of over 55 miles per hour for tomorrow. The winds are coming from the north/northwest, so I expect that means cold air will be arriving. When it clears up, I will eventually head to Massachusetts. I may first do a little trip in northern Vermont to see some land that may be desecrated in the future by anew interstate highway. At the hiking conference, I found out about two seriously proposed interstate highway projects that are threats to the Appalachian Trail. One is in north Georgia which I won't discuss. But I am alarmed about federal funding that has been set aside as "high priority" that would be an interstate highway in an east to west direction from northern Maine to northern New York. This highway would start at the Canada border of New Brunswick and Calais, Maine and head east to interstate 81 at Watertown, New York. This proposed interstate will go through all rural areas and would not be connecting any big cities. A person can drive west from Bangor, Maine on U.S. route 2 to Rouse Point, New York by Lake Champlain and then follow U.S. 11 to Watertown, New York. This interstate would go through the North Maine Woods, the white Mountains of New Hampshire, the Northeast Kingdom of Vermont and along the Saint Lawrence River of New York. The idea of the road is to promote economic development. The other idea which is more beneficail for Canada is that the new divided highway is a shorcut from Ontario to New Brunswick. In other words, traffic can avoid the Province of Quebec. All the land where the new Maine to New York interstate highway will go through the most rural and most pastoral parts of northern New England. The highway planners hope it will urbanize northern New England. I read a newspaper article about how Maine has lobbied the federal government for the new interstate highway. Now Robert, we all hear about demands for highway projects to reduce traffic. It seems absurd to me to build an interste highway in areas that have rural roads and hardly any traffic. The thinking behind this Maine to New York interstate highway is to attract traffic first,so that business development will follow. The new interstate would go through areas of mostly private foests and potato farms in northern Maine. Any geologiost would tell you that it would be extremely expensive to blast through the granite of the White Mountins in New Hampshire and Green Mountains of Vermont. It bugs me that there is talk of eliminating AMTRAK and yet spending money on an expensive and totally unnecessary highways project such as the Maine to New York interstate. Hardly anybody knows about this Maine to New York highway project. It would ruin the remote rural quality of northern New England. If you look at a road atlas, you can visualize the proposed route from Calais, Maine to Watertown, New York. Highway supporters argue economic development for a higher standard of living. I say, don't build the highway and keep the excellent quality of life. The Northest Kingdom are the three northest counties in Vermont of Essex, Caladonia and Orleans. When I was 18-19, I attended Sterling in Craftsbury, Vermont. So I know the area well. The samll rural farmers may have less income than farmers in Iowa, but they produce maple syrup, harvest small woodlots, raise dairy cows and sheep and crops like potatoes that need a short growing season. Why build the interste highway that would disturb a part of America that has not changed much in the last 100 years? By walking and bicycling, you have shown me in your website that you can GO SLOW and GO FAR! It bothers me that Democratic U.S. Senator Robert Byrd got funding for new divided highways across the Appalachian Mountains in West Virginia. I love his opposition to Bush, but disagree with his highway projects in West Virginia, which require a lot of blasting and scars on the land. For example, he wants a divided highway called route 9 across the Blue Ridge Mountain and the Appalachian Traill to funnel into commuter traffic bound for Washington, D.C. on Virginia state highway route 7. His other big projects are west from Strasburg, Virginia towrds Charleston, West Virginia called the corridor H project. I propose that we can solve some of the commuter traffic problem from Winchester, VA to the Washington, D.C. area by going back in history. Have daily pasenger train service on the Baltimore and Ohio freight railroad track between Harpers Ferry, West Virgina and Winchester, Virginia. This branch line is about 20 miles beween Harpers Ferry and Winchester, Viirginia. In Harpers Ferry, AMTRAK and Maryland run commuter trains commute workers only on weekdays to Washington, D.C. If there were many trains, people could use their time to read the newspaper instead of moving a steering wheel in their cars and pollute the air. Back in the Civil War, that 20 mile B and O railroad track was faught over a lot and Winchester changed sovereignty 72 times between Confedrate and Union contraol. That rairoad track moved people and gear which was important for both armies during the CIvil War. Our country is so into private rights, that the B and O railroad will probably not allow any passenger trains on that branch track. Well I argue that it is time for the private railroads to recognize that they were given free land by the federal government in the past to lay down railroads to move PEOPLE and freight to help settle the west. They made money off of the fereal land grants and now they need to be held to their original mission. AMTRAK needs to be kept and improved. Commuter rail options should be explored and I don't think that freight companies should have the power to say no. Federal emminant domaine power could be used to build a passenger only railroad track where the rairoad companies say that their single tracks should be used for freight only. Emminent domaine is for the common good and that private property owner does get fedral money compensation. Emminant domaine is used for highway building to buy out farms and private landowners. Emminant Domaine says the private properety owner has to give in for the common good project such as the highway or school, etc. In San Francisco, I read in the newspaper about adding downtown density living apartments with no parking. In other words, you could rent an apartment that there is no parking that goes with it. San Francisco has a traffic and parking problem. This idea is viewed as radical, but we agree that there are people like us who would be happy with "no parking appartments". Your idea of a car free living area is quite a reasonable solution. I like your web site and I followed your 2005 trip of pictures and great narrative. I am glad you enjoyed your 2005 Northwest adventure. I think you would enjoy a bicycle trip by Lake Champlain between Vermont and New York. There are bike path and country roads in New England that you would enjoy. You could ride the AMTAK to the east and then start bike riding. September is usually an excellent month. The big islands on Lake Champlain are flat, rural and scenic. Burlington, Vermont is cool University of Vermont student town with lots of Belllingham like culture.